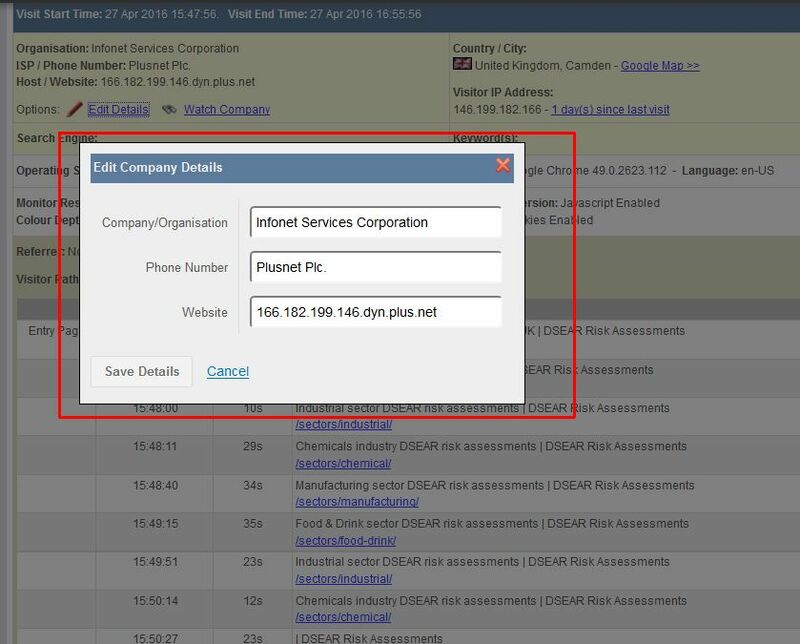 Not all your current customers will be identifiable as a business by their IP address. For example, you may have a customer that is set up in a way that identifies them as being just a ‘BT broadband’ customer. This means that your customers may be visiting your website and you would have no idea about their visit or what they looked at. They just need your contact details. They may be contemplating additional services or products that you can offer. They may be at risk of being lost (e.g. a competitor may be trying to win them from you and your customer is double-checking your website to see if you can offer what your competitor is offering). If you’re able to easily identify all your current (and future) customers whenever they go to your website, then you can respond quickly, based on their visit patterns. As an example, if a customer has visited your website and you haven’t had much dialogue with them recently, then you have a great opportunity to reach out to them. You could say that you’d identified that they’d been to your website (which makes you look proactive) or you may not mention it (but they may mention that they were on your website recently of course). Although you would need to invest some time/resource into going through this exercise, the ongoing benefits of identifying your customers would outweigh the short-term time/resource investment. Whether handled internally or outsourced (e.g. to a telephone contact operation), you will need the names of your customers and their telephone contact numbers. You will also need a good reason to call them and to get them to go to your website. 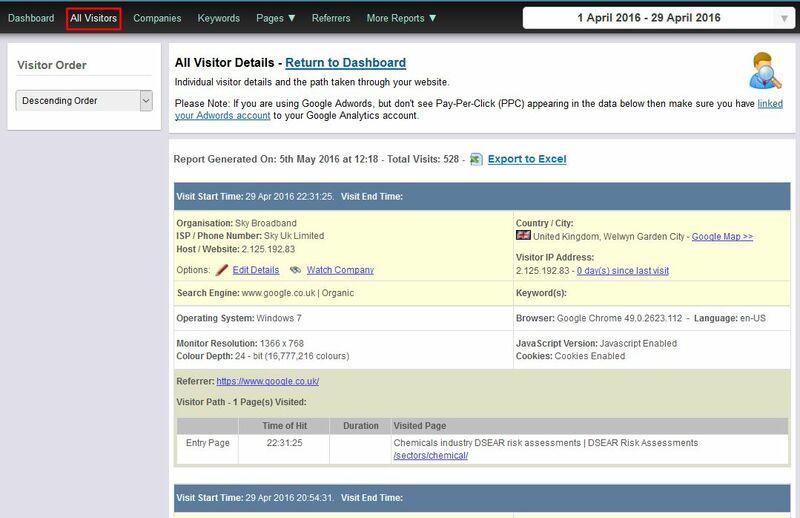 Within the A1WebStats system click on ‘All Visitors’ from the main navigation bar. There may be more than one visitor on your website at the time of the call and your objective is to identify which of those is the person on the end of the telephone. After they’ve gone to the website page you’ve encouraged them to, refresh your browser and look through the visitors on your website more recently. You are looking for the grey part of each visit to identify the person you are talking to. 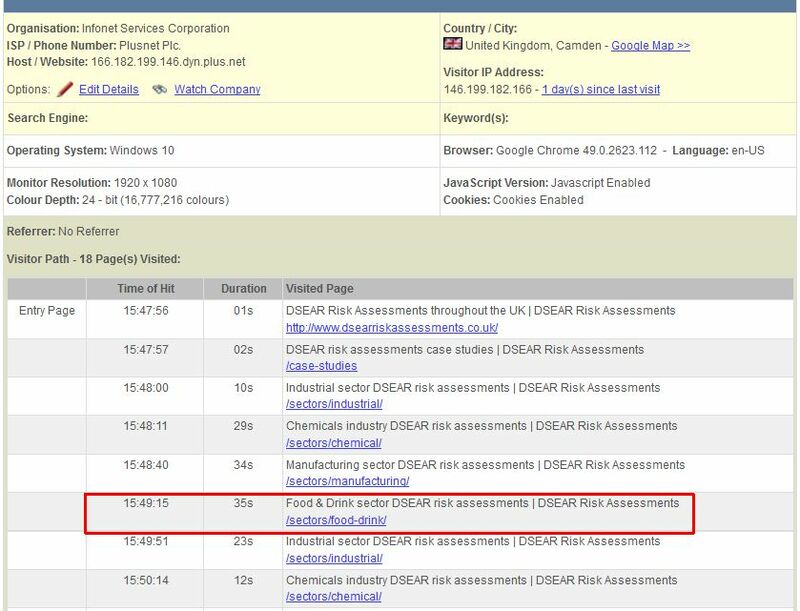 In the example below, the person on the end of the phone went to the http://www.dsearriskassessments.co.uk/sectors/food-drink page at 15:49 pm during the phone call. Having identified the visitor within the A1WebStats data, you can now click on the ‘Edit Details’ link, which will bring up the details currently held against that IP address. You can now edit the ‘Organisation’ field so that it reflects the name of the person you’re speaking to, as in the example below. You don’t have to also edit the phone number or website fields but can if you want to. All data that is entered to these boxes is for your private use only. It doesn’t get centrally applied to our database but instead is applied to your account only. The website page can be a tempting place for the call recipient to go to, which makes the job of the caller easier. You will get valuable data from the call that wouldn’t have been possible from purely a courtesy call. If that customer comes back to your website in the future then you will easily identify them. 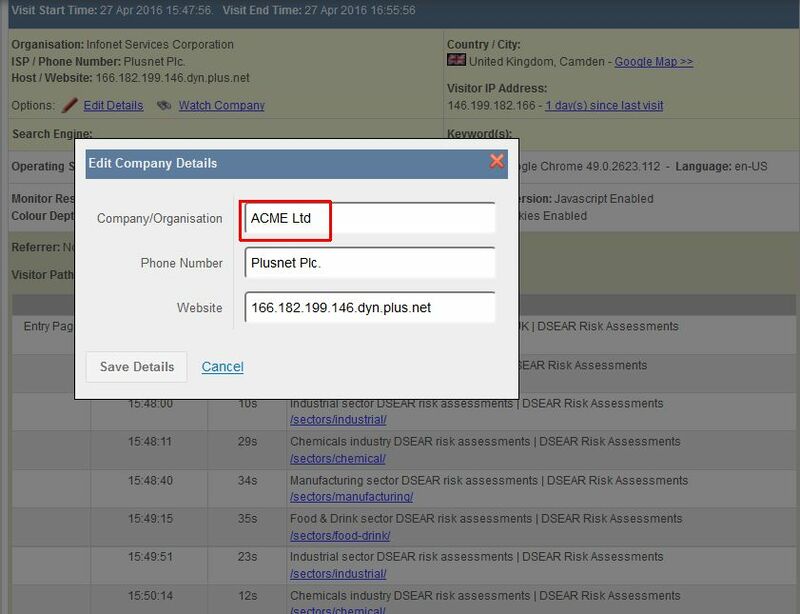 For information, your A1WebStats account details can be shared with as many people (internal or external) as you want to – there are no restrictions on numbers of logins. This means that whoever is calling your customers can use the system to create more value from the calls they make.